Highland Landscape & Snowplowing has been providing quality landscape and snow removal services since 1991. Jeff Speaks started mowing lawns while he was attending Eastern Michigan University, pursuing a degree in Business Management. During this time, Jeff became interested in other facets of landscaping with a focus on design in landscaping. He began attending design seminars and specialized classes while gaining hands-on experience installing landscaping projects and brick pavers. He used his hands-on knowledge of the business, specialized training, and his degree in Management to form Highland Landscape & Snowplowing, Inc. Jeff’s wife, Christine, is Highland’s President and Business Manager keeping Highland a family-owned business. She handles all the day-to-day operations in the office. Highland has a highly qualified crew at every job. 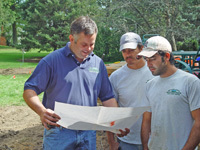 Landscaping and design employees have taken training courses and worked side-by-side with specialized designers. Our committed and loyal employees are key to Highland’s success. We are licensed & insured and we provide excellent workmanship. Specializing in both commercial and residential landscaping and maintenance, Highland prides itself on being reliable and punctual, because we know your time is valuable. You can expect nothing less than the best customer service from Highland Landscape and Snowplowing, Inc. Following up and being reliable are the keys to our business! Our company specializes in both commercial and residential landscape design, brick paving, and lawn maintenance. Our clients include single residents, condominiums, apartment complexes, churches, subdivisions, corporate office buildings, and retail. Our snow removal business focuses primarily on commercial properties. Condominiums, apartments, office buildings, retail, and subdivisions are among our clients.